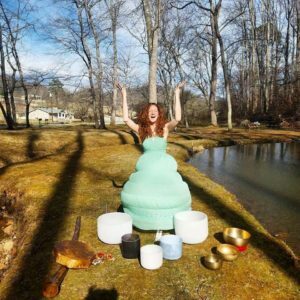 Sound Healing Services provided by Samantha Stokes. Samantha is a divinely inspired, intuitively led sound healer practitioner. She has been gifted almost every instrument she has and was called into the service of being a sound healing. She tunes into the music of the moment and allows herself to be a conduit, an instrument with healing sound. Samantha plays crystal and Tibetan singing bowls, unity harp, chimes, drums, rattles, and didgeridoo. Her voice is her most refined instrument, singing comes very naturally. She has collected many healing songs on her journey. These songs are medicine, sung from her heart to the heart of the listeners. When she plays, the room fills with the frequencies of divine sister/mother; full love, acceptance and surrender to what has been, what is, and what's to come. Do you want to find out more and start a conversation with Samantha?